I always feel that my day starts right when a story involving the Voyagers crosses my desk. The scope, the sheer audacity of these missions in their day cheers me up, and the fact that they are still communicating with us is a continual cause for celebration. With Voyager 1 now moving beyond the heliosphere, we’ve got an interstellar craft on our hands, one that’s telling us a good deal about the perturbed regions through which it moves. Every day that the Voyagers stay alive is a triumph for an inquisitive and exploring species, and one day we’ll be launching their successor, targeting the local interstellar medium with instruments designed for the task. Image: This artist’s concept shows NASA’s Voyager spacecraft against a backdrop of stars. Credit: NASA/JPL-Caltech. The heliosphere is that ‘bubble’ blown by the particles of the Sun’s solar wind in surrounding interstellar space. As such, it’s a moving and malleable thing, flexing, flowing, contracting here, expanding there according to the stream of particles filling it from our star. Now we’re finding, not surprisingly, I think, that the magnetic field just outside the heliosphere is perturbed. Voyager 1 data show that the magnetic field here is more than forty degrees at variance from observations of the interstellar magnetic field that have been produced by other spacecraft. Remember that while Voyager 1 is the first spacecraft to reach such distances from the Sun, we’ve had other missions exploring the outer regions of the system even though they operate well within it. The Interstellar Boundary Explorer (IBEX) is the outstanding example. Launched in 2009, IBEX is in Earth orbit (apogee 322,000 kilometers, perigee 16,000 kilometers), using instruments that track the solar wind’s interactions with ionized interstellar material. Like the Ulysses spacecraft before it, IBEX is also measuring inflowing neutral particles that penetrate the heliosphere, in the process creating a map of the Solar System’s elastic boundaries. 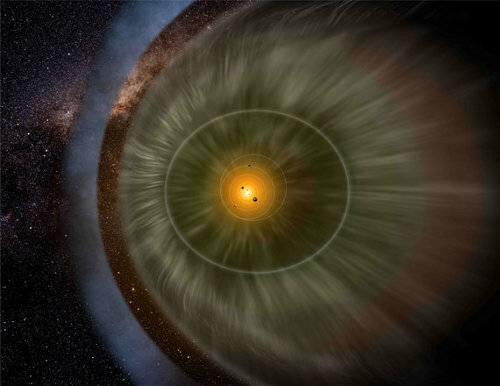 Image: An artist’s rendition of a portion of our heliosphere, with the solar wind streaming out past the planets and forming a boundary as it interacts with the material between the stars. Credit: Adler Planetarium/IBEX team. IBEX has already told us a lot, including the fact that our Sun is located in a region of space where dust and gas are much more dispersed than they were when the Sun was formed. With IBEX data, scientists can map the distribution of elements like hydrogen, helium, neon and oxygen as they enter the heliosphere, and can use the neon to oxygen ratio in the Sun to trace element ratios in the distant past. We see less oxygen than expected in the interstellar medium today, indicating the changes to the medium since solar formation. We also see that our Sun is close to the boundary of a local cloud of gas and dust, but still within it — this work challenges earlier Ulysses findings that found the Sun to exist between two clouds, though close to the boundary of the ‘Local Cloud.’ Within a few thousand years, we will be moving out of the Local Cloud and into a somewhat different galactic environment. IBEX, then, is helping us understand the general region of space through which we move, while Voyager 1 is reporting on conditions just outside the heliosphere boundary. In 2009, IBEX data showed what principal investigator David McComas (SwRI) called a ‘very narrow ribbon that is two to three times brighter than anything else in the sky’ at the interstellar boundary. While this circular arc is still under study, the current view is that it is produced by neutral hydrogen atoms from the solar wind that were reionized in interstellar space and then became neutral again by picking up an additional electron. (For more on IBEX, see IBEX: The Heliosphere in Motion). This is where the recent Voyager findings come in. Nathan Schwadron (University of New Hampshire) and colleagues have reanalyzed magnetic field data from Voyager 1, discovering that the direction of the magnetic field has been turning ever since the craft crossed into interstellar space. The work, published in Astrophysical Journal Letters confirms that the magnetic field direction at the center of the IBEX ‘ribbon’ is aligned with the magnetic field in the interstellar medium. Voyager is, in other words, now moving through a distorted region. By 2025, the magnetic field around it should align with the field direction found by IBEX. At that point, we’ll be able to say that Voyager 1 has reached a more settled part of the interstellar medium, less perturbed by the ‘churn’ of the heliosphere. “This study provides very strong evidence that Voyager 1 is in a region where the magnetic field is being deflected by the solar wind,” says Schwadron in this JPL news release. 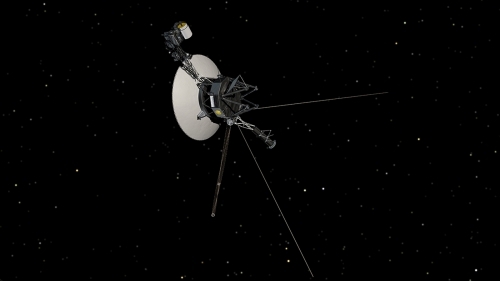 A Voyager follow-up mission will be built from the outset as an interstellar probe, carrying instruments optimized for exploring this active boundary. We can hope that one day even more ambitious missions will use the data thus gathered to chart the regions through which they’ll fly on their way to another star. The paper is Schwadron et al., “Triangulation of the Interstellar Magnetic Field,” Astrophysical Journal Letters Vol. 813, No. 1, L20. (abstract). I think an Eris fly-by would be good for a Voyager follow-up, with instruments both for Eris and the IM. Another great summary of salient points of interesting research that some of us can’t easily come by on our own. Anyone have anythoughts on some significant things we might learn from interstellar sensing? How might it inform the study of abiogenesis or where or whether life might be? Is Voyager capable of detecting organics, for instance? What properties of the interstellar medium, other than magnetic, that we can only learn by the presence of a probe? Food for thought when we do launch “fast” interstellar missions that will still take decades and centuries to reach other star systems in regards to keeping the software updated when transmissions will take years for a single two-way conversation. If we light/electric sail to the Oort and the stars, how important are these fields and particle streams to performance? Will we want to map them to maximize sail velocity and even navigate within them? Of course this popular news publication will try to craft a story out of nothing. Even though not as often seen as it used to be the case, it’s still a very normal thing for the best systems engineers to program in assembler, or just machine code by hand. It’s just not en vogue as it used to be because modern programming languages and their compilers are a lot more efficient at translating human-readable programming languages into binary. VOYAGER is a workhorse. The ISM has properties that only a ‘local’ probe could detect? It would be wonderful to see some exotic comet-forming mechanism with the collision of all that deep space ‘smoke’? The role of a ‘triangulation’ deep space buoy is of obvious value. Pity it couldn’t have been designed with a breeder reactor, get another 70 years of telemetry out of that vagabound beastie. 2) Scattered disc ice-dwarf flyby. That’d please people in many different fields! Might be able to work in a flyby of a minor TNO as well. Put a large aperture imager on it (2m+) and you’ll get great data for months even with the high relative velocity. How dense a cloud of dust and gases must be ,when the sun travel through , for the back scattered heat to be enough to impact the Kuiper objects,or a small planet like Pluto ? You see ,imagine the whole solar system being inside an oven ,the cloud being a black body heated by the sun and radiating in every direction . Even a very small amount without any consequences on Earth could be a major factor on the external bodies. At some point we will have to test the interstellar environment proper, the gas and dust concentrations will need to be known with closer accuracy if we are to launch high speed probes to the Stars. One dust particle could prove disastrous and gases erosive. Here is an interesting article on interstellar dust from a surprising space craft, Ulysses. So on the whole it looks like we are fairly safe will high speed craft to the Stars. There are many active and passive means to deal with gas and dust, it is the larger bits of debris that are the problem but thankfully they are quite rare as they would contain enormous amounts of energy released very fast. It is good to see the artistic/humanities communities sharing these projects with the general public, as the space sciences need all the connections between the Two Cultures as it can handle.